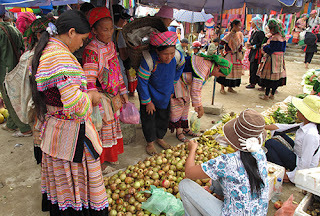 Home > Sapa Market > Cao Son market ( Wednesday Only ) is really impressive by real people in their real life. Cao Son market ( Wednesday Only ) is really impressive by real people in their real life. The road trip here takes about 2 and a half hours from Lao Cai (75km) and 3 and a half hours from Sapa(115Km). Cao Son market is simply set in a fascinating nature and surrounded mountains which covered by lush plantation and terraced rice paddies and cornfields. Most the participants are Flower H’mong, Black Zao, Nung, Tu Di, Pa Di ethnic form villages in the surrounding region but many come from China to add more colors to the market. Cheerful and smiling faces are everywhere at the market place and the peoples behave like close friends meeting again after long time away. It is easy to realize women from different groups through traditional costumes they wear while men’s dress are similar. Per week for just one session meeting on Wednesday, at the market session, right from early morning,individuals or groups of ethnic minorities come to Cao Son Smarket. 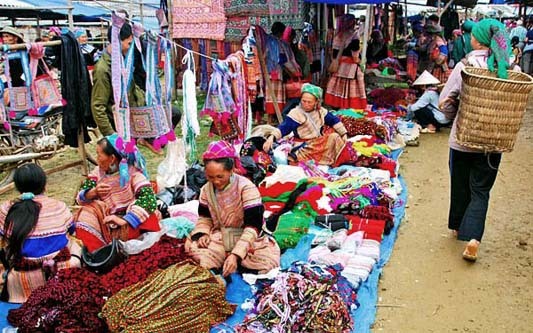 The area which sells specialties of mountain and forest here such as vegetables, herbs, mushrooms, wood ear, honey, wine, corn, rice and other household appliances, jewelry … All of them are concentrated in a zone, arranged beautifully by each item. These are sophisticated products which show skillful talent of Mongolian woman, women, and women leaves Phu Dao in planting flax, keeping fiber, weaving, dyeing and embroidering flowers their flowers. The area, which attracts attention the most, is the area of selling the livestock and poultry such as cattle, pigs, chickens, dogs, horses … Air in this area is really bustling. Next is the area for the ethnic dishes. Here, visitors will be easily attracted by the seductive flavors from certain types of cuisine such as “thang co”- a pan mixing buffalo meat, horse meat and beef … of Mong people, slightly spicy tastes some natural wines. Coming to Cao Son market, tourists will have the chance to enjoy interference cultures of some ethnic groups living in villages along the Chay river in Muong Khuong district.More over, a trip here to the market in combining with exploring and visiting the villages nearby is a special offer to those who dare to forget modern facilities of city life and dedicate time and energy to the discovery of the local traditional values.